Email Us Meranda Marie THOMPSON2 was born on 12 February 1991 in Lewiston, Idaho. !Infor. in file is from Kathleen Ann Thompson, (Pfliiger). Kathy Ann, childs mother, apparently doesn't believe she was married to Mike K. Gutgsel l. She used the last name Thompson for the child. Parents: Mike K. GUTGSELL and Kathleen Ann THOMPSON. Michael (Mike) THOMPSON2 was born in March 1957 in Texas. Parents: Virgil Dewayne THOMPSON and Frieda . Millen Enevald THOMPSON1,2 was born on 24 October 1888 in Belford Twp., Near Letcher, South Dakota.3 He died on 24 December 1979 at the age of 91 in Corning, IA. He was buried in Strand Cem., Strand, Iowa.3 nfor. in file from records of Luella Thompson Feland, and Millen Thompson. Millen and Emilia moved to Landa N. D., where they farmed. Returning to Carbon, Adams County Iowa where they also farmed. A family record in file shows; Millen-Emelia Thompson, Millen E. Thompson (Oct. 24, 1888) son of Andrew and Lettie Sanstol Thompson near Letcher, South Dakota. (See Andrew-Lettie Thompson). Millen moved to Adams County with his parents about 1892. He learned to do many trades. He helped his uncle Carl Thompson in a blacksmith shop. They also did carpenter work. There was always adventure in Millen's blood, nothing too difficult to attempt. He moved back to North Dakota with his parents. Millen and Velma continued living there until 1935. Millen did custom farming for many years. He purchased the Gordon Dalgetty farm in the mid 1940's. In 1947 he sold machinery and did carpentry. Velma married Robert Timmerman in 1942. Millen loved to travel. He and Velma visited relatives in the Dakota's, California, and Washington state. Usually taking someone along and always being sure everyone had wonderful memories to bring home. There was always someone waiting for Millen to help, like teaching youngsters to drive, or just go for a jaunt with the car filled with kids. Widowed 24 years, October 22, 1953, Millen married Abbie (Sunken Dorr) Lucas. They enjoyed their home and families, celebrating their 25th anniversary and Millen's 92 birthday. Millen died Christmas Eve (24 Dec.) 1979. He was laid to rest in the Strand cemetery. Millen kept in touch with his many relatives by typing letters hunt and peck. There was always a new story about his past to relate, making it a pleasure to call on him. There are many homes in the community that display his handiwork. His wife Abbie is a resident of Colonial Manor Nursing Home in Corning Iowa. By Daughter Velma Timmerman. It has been an interesting reading what you have of the family tree and have learned a lot of things that was new to me, thanks a lot. First I want to tell you that Oscar Thompson is just his american name as he had it changed when he came from Norway, his dad was named Thom. so he just added Thom-pson, his name in Norway was Asbjorn Hammersmark so you can see why he changed his name. On the paper you have it Wagga, his name is Ole Waaga and also you had Peterson which is Hans. Now some of our history. 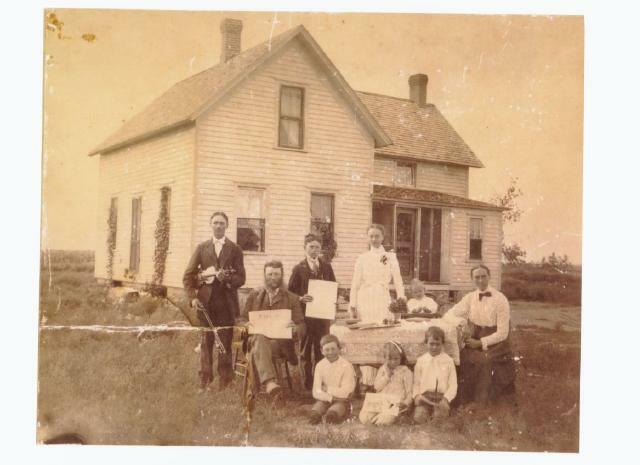 Mother and brothers and sister immigrated to america in 1880 and located in Strand Iowa. She was born 1/2/1855 to 6/6/1946. Father was born in LaSalle County Ill., 3/10/1857 to 10/17/1921. I don't have any date or records of their marriage, but it must be about in 1880, as there was a baby born in 81, who died as an infant. Charles was born 8/19/1882, and after that they moved to S. Dak. They lived in S. Dak. till about 1889, as I was about a year old when they came to Iowa again. The folks had a store at Strand, with a Post Office, for a few years, and then moved the store building to the farm where we resided till the spring of 1902, when they moved to N. Dak.. They lived and farmed in N. Dak. till the spring of 1918, when Charles and the folks moved to S. Dak. It should be Charles and family. The folks had retired, and they lived with a nephew, John Thompson, and mother kept house for him, till father died, and then she went to live with Annie Storla, (daughter) till her death. Father farmed and was a Thresher and did carpentry work, after the store was closed. He had a threshing machine, and was run by horse power for years. Then they went to steam engines and he traded his machine here and had one delivered to Souris N. Dak. in the fall of 1908. He continued that till he retired in the spring of 1918. Charles farmed and ran a small dairy in Landa N. Dak., and delivered milk to the people of Landa till 1918, when he moved to S. Dak., and farmed there till about 1936. When they moved to Calif., and worked for George. Lawrence went to Morton County and filed on a claim. After that he worked in stores clerking in Minot and Crosby N. Dak. For some years he ran an Oil station and delivered L P gas. We could get more information about Lawrence from Dorothy his wife. Dorothy Thompson, 4th st., Minot, N. Dak. 58701. Lizzie, after her first marriage lived in Landa N. Dak. And he clerked in the hardware store for a few years. Then they moved to the farm, and he farmed till his death. After her second marriage, they farmed for some time, then moved to Mitchell S. Dak. for a short time. They then bought a house in Bottineau, N. Dak., where they still live. Millen; I came back to Iowa for a visit and a wedding in the winter 1912. And again in the fall of 1913. Was married, and went back to N. Dak., and farmed till the fall of 1917, when we came back to Iowa for a visit, and while here, we rented a farm, and I went back to N. Dak. and sold out. We farmed till 1935 when I stopped farming for myself. I did commercial farming till 1947, when I sold the machinery, and started to do carpenter work and plumbing. Now I am supposed to be retired, and just work on some little jobs, when they cannot get anyone else to do it. Carrie after she was married lived and farmed in S. Dak. In the early 1930 they moved to Washington where she died in Bremerton. Annie, after she was married they had a store at Elsworth Minn. for some time. She also did the same in Mt. Vernon and Storla. He then worked in N. Dak., and South Dakota adds for farm directorys till he died. George was going to collage when the war broke out. He enlisted, and was paymaster and office worker. After that his army boss had a box factory in Sacramento, and got George to come and be book keeper there, and he would buy in that, till he had a big share in it. They sold out and retired. Now they live at 297 Belhaven Cir., Santa Rosa Calif. 95405. Mary has been working on the same thing, and if you could get in touch with her, she may have something you can use. I know you have things she has not found. I know George could give a lot more about him and family. Mary had an operation on her brain, and had not gotten as much done as she wanted to. They had the papers that Allie was sending to you, so I hope you have them by now, as Arlie just wrote me that he had them now. Celia after her marriage, they farmed in N. Dak., till his death . She then lived in Bottineau for a time, and then went to Seattle, where she is now. I know she would give you a lot of information and dates. I will write her, and give her your address, and ask her to send the information. Hope you can get something out of this, and can get more direct infor. and the correct dates. I will write to Dorothy and have her send more about Lawerence. She is keeping house for her brother in Minot N. Dak. Well we are having fall weather, but no frost as up to now, but can look for it at any time. I am still picking Tomatoes and Cukes, and they are still blooming. We have had over four inches of rain since 8/8/, but we are still over nine inches below normal. No rain from June 8 to Aug. 8. There will still be a small crop for the farmers, they are busy now putting it into the silo. We were down to see Sanna the other day, and she sure looks good . She has had the operation on her other eye, and is to go back and get her eyes tested and glasses fitted soon. She was still staying with Arlene, but was going to move to her place in a few days. Well it is nice hearing from you, and about things up in Alaska. It is so far up north, and we just think it is all ice and cold weather, all the year round. Like when we lived in N. Dak.. A fellow was asked how long they had cold weather up here, and he said he did not know, as he had only been there 11 months. I hope you can get something out of this, and I will try to get some more, and send it to you, if I do. Here is wishing you the best of luck, and stay well, and we hope to see you again sometime. Well there is not much time left till xmas and soon our year 1975 will be a thing of the past. We have been having so much nice weather so we are spoiled and hate to see a cold day. It is cloudy and damp this morning and there is enough dampness coming down so it is freezing on the railings, but not enough to make the steps slick yet, it was 30 degrees this morning so it is not a bad winter day, I went out now and it is getting a little slick on the steps now but it has gone up to 32 so should soon stop the freezing. We have had a wonderful fall and winter up to now so will hate to see it get bad. We did have one day that it only got up to ten above zero but the next day it got back up in the 30ies again, we even had lightning and thunder and some rain the first of Dec. I have to go back to the doctor for a checkup again on Dec. 29th. and then he will tell me when to report back to the hospital. We just had company and I think they thought we might be starving as they brought eats along, Katie brought a Rasin Pie, her mother brought Buns, Cookies, and Candy and Bertha brought Cake so we can sweeten up some. We have the best friends that there ever was and they just don't think they can do enough for us. This is another day without sunshine and it felt like there was snowflakes coming down when I went out to get the mail but nothing showing on the ground, It is still 30 Degrees the same as it was this morning and still cloudy and gloomy as it was to start the day. As I went in to the doctor on Monday I met Sanna coming out as sh e had just been there for a checkup, She looked real good and said she felt real good, She is doing real good for her age. I have an appointment with the doctor today and no snow tires for our car so we have to make some kind of arrangement to get transportation to town. Velma and the kids are going to Omaha today to see the new grandson so they are not available, Anitta and Ronald are taking the aunt to read the will so they are gone, I may call the Dr. and see if I can make a change til l Friday as that is Abbies day to see the Dr.
With lots of love and best wishes to all. Tue. morning. A nice clear morning and not to cold for a winter day just at the freezing mark now and no wind, A nice bright sunshine so it is sure nice to look out and the snow is gone. A year ago the middle of Dec, I had a sore toe and was in the hospital with that and got home the 2nd of Jan. and last week was the first I could use shoes again. Have had to go with house slippers all that time so I was glad to put the shoes on. I could use my boots but was not out where I had to use them. We received about 200 Birthday and Anivversary cards and I had to give up on answering them all It sure was nice hearing from them all. Velma just called and we are going over to town and have something to eat so I don't have to fix any here, They are better cooks then me. Well we are back home and Abbie was feeling real good and had other company too. She had other company as to her daughter Ada. Adas daughter and a grand daughter and Adah brought her mother in law so she had lots of company. Velma went out to Lincoln Nebraska to see Lois and Paul. On her way back she stopped at a grand daughter and they had some young pups so she got a young pup for me. We took him over to show Abbie and a guy in there asked if that was to be a bingo prize so now I call him Bingo. I have been having the floors covered with papers for safety, He has done so well so now if he wants to go out at night he comes and scratch on the bed for me to let him out. Thanks again for your letter as we realy like to hear from all . I realy do not like the job of writing but have not found a way to hear from them other wise. Died of Pneumonia. Parents: Andrew Thomas THOMPSON and Taletta Tobine "Lettie" JONASDTR. Spouse: Sarah Emelia OLSON. Sarah Emelia OLSON and Millen Enevald THOMPSON were married on 22 October 1913.3 Children were: Baby THOMPSON, Velma Lois THOMPSON. Minnie Elizabeth THOMPSON2,5 was born on 22 March 1898 in Strand, Adams Co, IA. She died on 25 January 1964 at the age of 65 in Spokane, Spokane Co., WA. She was buried on 28 January 1964 in Riverside Cem., Spokane, Washington.3 Minnie was a Mother, Cook, Housekeeper. She was educated Eighth Grade, Beyond. She was Pentecostal. Infor. in file from records of Luella Thompson Feland. Another record shows the 22nd as day of birth. She was a housewife, and belonged to the Assembly of God church. Minnie was a hard worker and a wonderful grandmother. She took care of Clara McCoy Bault, her mother-in-law after she became blind. Parents: Carl Tobias THOMPSON and Marietta Lovina BENNETT. Spouse: Herschel Rex BAULT. Minnie Elizabeth THOMPSON and Herschel Rex BAULT were married on 13 May 1922 in Pendleton, Umatilla Co., OR. Children were: Dorothy May BAULT, Delcia Fay BAULT, Delmer Ray BAULT, Veral Cope BAULT. Parents: Anton Severine THOMPSON and Nellie MCCONOUGHEY. Noah Christian THOMPSON was born on 20 February 1997. Parents: Ryan David THOMPSON and Lisa FERGEN. Norman Keith THOMPSON1,2 was born on 28 May 1926. Parents: Peter Olaus THOMPSON and Darlene Vinnie HUNTER. Spouse: Bette SCHAEFFER. Bette SCHAEFFER and Norman Keith THOMPSON were married on 27 October 1981. Norris Jerome THOMPSON1,2 was born on 15 February 1941.3 Infor. in file from records of Luella Thompson Feland. Norris was adopted. Parents: John Lawrence THOMPSON and Dorothy Bernice WALDREN. Spouse: Janice BECKER. Janice BECKER and Norris Jerome THOMPSON were married on 19 October 1968. Olivia Gabrielle THOMPSON was born on 26 February 2001. Parents: Ryan David THOMPSON and Lisa FERGEN. Ora Harold THOMPSON2,5 was born on 25 May 1903 in Nodaway, Adams Co., IA.3 He died on 14 April 1987 at the age of 83 in Milton-Freewater, Umatilla Co., OR. He was buried. Hermiston Cem Ora was a Machanic. Parents: Carl Tobias THOMPSON and Marietta Lovina BENNETT. Spouse: Myrtle Irene CHRISTEN. Myrtle Irene CHRISTEN and Ora Harold THOMPSON were married on 12 December 1932 in Hermistonk, OR.3 Children were: Ronald Leroy THOMPSON. Oscar Cleven THOMPSON1,2 was born on 7 August 1937 in Mitchell, Davison Co., SD. Parents: John (Jonas) THOMPSON and Josephine Margaret CLEVEN. Spouse: Doris Mae DAHL. Doris Mae DAHL and Oscar Cleven THOMPSON were married on 31 May 1959.3 Children were: Quentin Oscar THOMPSON, Karla Mae THOMPSON. Oskar(Asbjørn Torkellson Hammersmark) THOMPSON2 was born on 6 October 1848 in Hammersmark, Tonstad Sogn, Norway.78 He died on 8 March 1925 at the age of 76 in Belford Twp, Aurora Co., SD. He was buried on 10 March 1925 in Trinity Cemetery, Sanborn Co, SD.9 (photo of 1890 home) (1909 map of Belford Township) Immigrated to US in 1880. Located at Strand, IA. 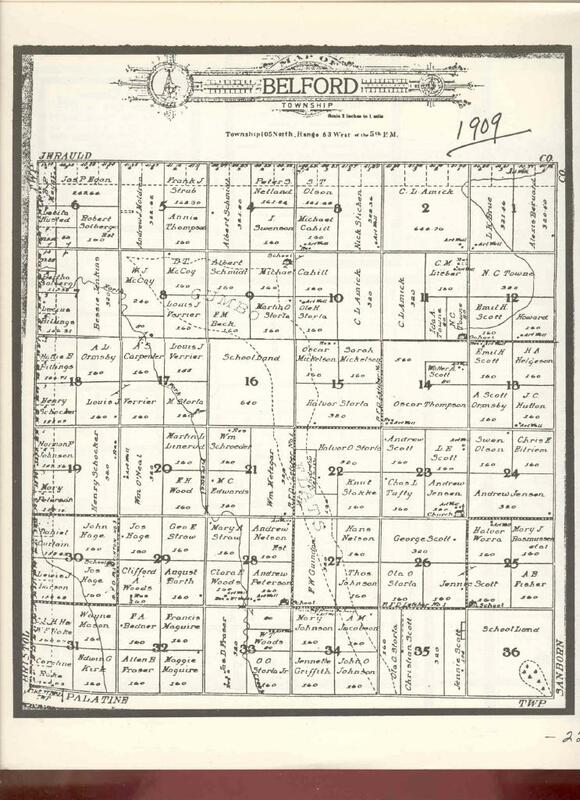 In spring of 1882 moved to Dakota and homesteaded in Belford Twp. Died from injuries sustained in storm of June 1924. Both Oscar and Elsie were charter members of Storla Lutheran Church. Parents: Torkel Torgerson HAMMERSMARK and Adlou LILAND. Spouse: Elsie Christine JONASDTR. Elsie Christine JONASDTR and Oskar(Asbjørn Torkellson Hammersmark) THOMPSON were married on 18 June 1879 in Parish of Lund, Norway. Realizing that in order to accomplish anything on their own, Asbjorn Torkelson and his bride, Elsie Sanstol, accompanied by Elsie's sister, Lettie, set sail for the enchanting land of opportunity, America! They had been married on the 18th of June, 1879, in their native land of Norway, but knew that in order to farm they would have to go elsewhere as there was just no more land available to be farmed as land was held in the family and as families grew they knew that they had no choice but to leave Norway. After landing in the "new world" they found their way westward to the prairies of Illinois where Asbjorn, now using his American name of Oskar Thompson (from Tomson, Tom being the English form of Torkel, his Dad) found work for the first winter but moved on west to Adams County, Iowa, where they settled temporarily to make enough money to help them head further west to the newly opening Dakota Territory where homesteading was rapidly taking place. It was while the Thompsons were living in Iowa that their first of four sons, Thomas, was born- on July 3, 1880, some 102 years ago. The beckoning of the Dakota prairie drew Oskar, and his new brother-in-law Andrew Thompson, to travel by train to Mitchell, Dakota Territory in the fall of 1881 and then travel by their team and wagon to eventually settle and stake claims in Belford township, Aurora County, Dakota Territory. After claiming their homestead sites and filing the necessary papers in Mitchell, the two brothers-in-law continued using their overturned wagon as their "quarters" while they were securing materials and then building housing for their families. The two adventurers returned to Iowa and their families for the winter of '81 and were ready to move west to their dreamland of opportunity. While Andrew and Lettie settled on a neighboring homestead, we'll continue the narrative of Oskar and Elsie from here, although we can not exclude them either, as both families remained very close to each other. The Spring of '82 brought in numerous homesteading families, these usually settling further west than the earlier pioneers as more and more of the available land was being claimed. So it was that the Oskar Thompson family got situated in the NW 1/4 of Sec. 14 of Belford Township, Aurora County, where today one of his grandsons is still farming. The Thompson family grew larger with the birth of Annie (who was the first recorded white girl born in Belford Twp.) on Sept 14, 1882, then Lottie, who died in infancy, then John on July 10, 1887 (which was also the date of the Patent on the Homestead quarter), then Lewis on April 7, 1890 and Peter on June 10, 1892, Lisa on Jan 26, 1895 and Ella on Nov 18, 1897. An adjoining qtr. (SW1/4 - 14) was purchased to which the family moved and on June 3, 1901 the last of the family Alida (Letha) was born. The Thompson family was now firmly established and was making its mark in the growing community. Never was anyone turned away from the door hungry or tired as the Thompsons were very accustomed to inviting both neighbor and stranger in, whether for a meal after church on Sunday or perhaps even lodging for the winter. As time went on, another quarter of land in the same section was purchased where a new modern home, complete with electricity and central heating, and soon thereafter indoor plumbing, was built and then in the Fall of 1915 Oskar and Elsie, along with Louis, Letha and Ella moved to the NE 1/4 of 14. Pete and John stayed to farm the home place along with Lisa who kept house for her two brothers until Lisa married Roy Hutton on April 2, 1919 and moved to a nearby farm. Annie had previously left home when she married Torkel Asbenson in Wisconsin on Nov 28, 1909 and Tom had also left, doing business on his own. Letha married John Berg on June 22, 1922 and moved to their rural Mt. Vernon farm. The infamous windstorm of '24 took its toll not only of many buildings in the area including the two nearby Lutheran churches, one of which was the Storla church where Oskar and Elsie were charter members, but also injured Oskar to the extent that he never fully recovered and subsequently died March 8, 1925. Tom married Elfreda Nelson on Sep 19, 1930 and they lived in Mitchell where Tom had a wholesale fruit business. Louie married Gertie Hanson on March 3, 1931 and they lived in the new house in NE 1/4 of 14 along with Ella and Grandma Thompson, until her death on Apr 20, 1941. The passing of Grandma Thompson ended a generation of, as they would have said, ordinary people, but we today honor them as great pioneers. Children were: Thomas (Torkel) THOMPSON, Anna THOMPSON, John (Jonas) THOMPSON, Lewis Tobias THOMPSON, Peter Olaus THOMPSON, Lisa THOMPSON, Ella Andrea THOMPSON, Alida THOMPSON. Pamela Jane THOMPSON2,5 was born on 2 February 1954 in Klamath Falls, Oregon.3 Parents: Lavern Ellsworth THOMPSON and Geraldyne Frances KENNEDY. Spouse: Patrick Murel DAVIS. Pamela Jane THOMPSON and Patrick Murel DAVIS were married on 17 September 1972.3 Children were: Deborah Ann DAVIS, Danielle Anita DAVIS. Pamela Renee THOMPSON1,2 was born on 27 December 1970 in Sacramento, CA. Parents: Dennis Charles THOMPSON and Sheilah Ann SEWELL. Paul Ernest THOMPSON1,2 was born on 8 June 1937 in Storla, SD.3 Parents: Ernest Leonard THOMPSON and Arlene Alice ASBENSON. Spouse: Beverly Jean HOFFMAN. Beverly Jean HOFFMAN and Paul Ernest THOMPSON were married on 11 May 1974. Children were: Erwin Miller THOMPSON, John Paul THOMPSON, Bryan Wesley THOMPSON. Peter Denton THOMPSON1,2 was born on 8 July 1961. Parents: Denton LeRoy THOMPSON and Janet Carolyn LARSON. Peter Olaus THOMPSON1,2 was born on 10 June 1892 in Belford Twp, Aurora Co., SD. He died on 28 October 1958 at the age of 66. He was buried in Graceland Cem, Mitchell, SD. Parents: Oskar(Asbjørn Torkellson Hammersmark) THOMPSON and Elsie Christine JONASDTR. Spouse: Darlene Vinnie HUNTER. Darlene Vinnie HUNTER and Peter Olaus THOMPSON were married on 7 June 1922. Children were: Eileen June THOMPSON, Norman Keith THOMPSON, Alvin Oscar THOMPSON, Denton LeRoy THOMPSON. Quentin Oscar THOMPSON1,2 was born on 27 July 1960.3 Parents: Oscar Cleven THOMPSON and Doris Mae DAHL. Spouse: Jodi Fay DAVIS. Jodi Fay DAVIS and Quentin Oscar THOMPSON were married on 2 January 1982. They were divorced. Spouse: Jacqueline Kay WENZEL. Jacqueline Kay WENZEL and Quentin Oscar THOMPSON were married on 18 April 1992 in Mitchell, Davison Co., SD. Children were: Sean Nicholas THOMPSON, Erica THOMPSON. Randy THOMPSON2 was born on 8 June 1951.3 Parents: Basil THOMPSON and Lillian . Randy Ray THOMPSON2 was born on 14 June 1954.3 Parents: Harvey Thomas THOMPSON and Reta Rae MANGLES. Spouse: Janet Lea THOMPSON. Janet Lea THOMPSON and Randy Ray THOMPSON were married on 26 January 1974 in Ashland, Kansas.3 Children were: Trevor Ray THOMPSON, Theresa LeAnn THOMPSON. Randy Warren THOMPSON2 was born on 21 May 1964 in Elgin, North Dakota.3 Infor. in file from records of Luella Thompson Feland. He is a mechanic. Newspaper articles in file; 5/1/1983, NEIGHBOR JAILED IN CONNECTION WITH SHOOTING OF lEWISTON MAN, A Lewiston man was shot five times with a small caliber pistol Saturday morning, and a neighbor has been arrested and charged by police with the crime. Nicholas A. Spellmeyer, 26, was taken into custody about an hour after Randy Thompson of 2111 4th Ave. North was shot in the chest, abdomen, leg, and arm, according to police reports. Spellmeyer was taken to the Nez Perce County jail, where he was held without bail until arraignment in Magistrate Court on Monday. Thompson was listed in stable but serious condition at St Joseph's Hospital Saturday evening after undergoing surgery. Police said Spellmeyer fled the scene of the 11:30 am shooting in a car belonging to Thompson's brother. He was arrested in the 1900 block of 13th Street in Rural Clarkston by Asotin County sheriff's deputies, according to Capt.Duane Ailor of the Lewiston Police Department, which is handling the case. Spellmeyer lives in a duplex apartment behind Thompson's residence. He moved to Lewiston from Spokane in December, Ailor said. Spellmeyer and Thompson apparently were friends, Ailor said, but he did not explain the circumstances surrounding the shooting. "We have more than one version (of the shooting); we'll try to ascertain what the situation was," Ailor said. "We have some pretty good ideas but we have to piece it together," he said. May 2, 1983, WOUNDED MAN TAKEN OUT OF INTENSIVE CARE, Randy Thompson, 18, who was shot times Saturday morning, was moved out of intensive care at St. Joseph's Hospital Sunday and was listed in stable condition and improving. He was shot in the chest, abdomen, leg, and arm, according to police. The shooting occured at 11:30 am at 2111 4th Ave. N. Thompson lived in a basement apartment at that residence. A neighbor, Nicholas A. Spellmeyer, 26, who lived in a duplex behind Thompson, was arrested Saturday and charged with the shooting. Spellmeyer was arrested by Asotin County sheriffs deputies after he had fled the scene to rural Clarkston, according to police. Spellmeyer is scheduled to be arraigned in Magistrate Court today. Worden set bond at $100,000 Monday for Nicholas A. Spellmeyer, 26, who is accused of shooting a neighbor five times Saturday in North Lewiston. Court will determine then whether to pursue the case and offer Spellmeyer the option of a preliminary hearing. Meanwhile, Randy W. Thompson, 18, victim of the shooting, was reported to be improving Monday but still in serious condition at St. Joseph's Hospital. Police said Thompson was shot in the chest, abdomen, leg, and arm with a .22 caliber revolver. Spellmeyer and Thompson live in separate buildings at 2111 4th Ave. N. and that's where the shooting occured, according to the police report. Police said the cause of the trouble remained under investigation, but it apparently was the climax of a personal dispute. Wednesday for Nicholas A. Spellmeyer, 26, of 2111 4th Ave. N. Apt. 2, Lewiston, on a charge of aggravated battery and a second count of using a firearm in the commission of a felony. Spellmeyer is accused of shooting Randy Thompson, 18, of the same address, five times on Saturday. Thompson was shot in the chest, leg, abdomen, and arm with a .22 caliber pistol, according to police reports. Spellmeyer is being held in the Nez Perce County jail in lieu of $100,000 bond. He is represented by Owen Knowlton of Knowlton and Miles. Thompson is listed in satisfactory condition at St. Joseph's Hospital and was said to be steadily improving, according to nursing supervisor. Court Wednesday on charges of aggravated assault and using a firearm to commit a crime, both felonies. He is accused of shooting Randy Thompson five times with a .22 pistol on April 30. Spellmeyer, 26, and Thompson, 18, have different versions of the circumstances surrounding the shooting. Spellmeyer told police that he was protecting himself after Thompson fired a shot at him. Thompson said Wednesday that Spellmeyer shot him for no apparent reason. Thompson testified Wednesday as a prosecution witness in a closed preliminary hearing before Magistrate Darrel Perry. The hearing was closed at the request of Spellmeyers attorney, Owen Knowlton. After answering questions for almost 30 minutes from Knowlton and Nez Perce County prosecutor Steve Tobiason, Thompson told the Lewiston Tribune outside the courtroom that he had no idea why Spellmeyer shot him. Thompson said he and Spellmeyer had been playing cribbage together earlier in the morning of the shooting. The two had been friends for more than a month he said. "He didn't seem like a person who'd go off the handle," Thompson said. "I don't understand it. He's always mellow, wasn't high strung." Thompson said he took a shower after playing cards and when he came out of the bathroom "he was standing with a gun pointed at me." Thompson was found at about 11:30 am by Lewiston emergency medical technicians in the street outside an apartment at 2111 4th St.where the shooting occurred. He had 5 .22 caliber bullet wounds according to the medical report. The shooting took place in an upstairs apartment according to police reports. Thompson lived in a basement apartment at that address, and Spellmeyer lived in an apartment behind the house at the same address. Thompson was released from St. Joseph's Hospital on Saturday after a week long treatment, including surgery to remove a bullet from his abdomen. One of the bullets remains lodged in his upper chest, he said the other bullets passed through his leg and arm. Spellmeyers version of the incident differs markedly from Thompsons. After his arrest in rural Clarkston shortly after the shooting was reported, Spellmeyer told Lewiston police detectives that he had been shot at one time by Thompson after leaving the upstairs bathroom at 2111 4th St. A struggle followed where he grabbed the gun and fired one or more times without seeing if Thompson was hit, according to the transcript in the court file of Spellmeyers taped statement to police. Spellmeyer told police that he was protecting himself by seizing the gun and firing at Thompson. Spellmeyer said that he and Thompson had been smoking marijauna and crystal meth, an amphetamine, since he joined Thompson at about 8:00 am to play cards. Thompson said neither he nor Spellmeyer had been using any drugs during the shooting. He said he didn't know if Spellmeyer was a drug user. Thompson was the only witness called to testify at the preliminary hearing. Spellmeyer will be arraigned in District court on May 25, one week later than usual because Judge John H. Maynard will be out of town next Wednesday. Spellmeyer's bond was reduced to $20,000, from $100,000. MAN ADMITS GUN ASSAULT, Nicholas A. Spellmeyer pleaded guilty Wednesday in Second District Court at Lewiston to aggravated batteryby admitting that he shot Randy Thompson five times with a .22 caliber pistol on April 30. A second charge of using a firearm to commit a crime was dismissed. Thompson, 18, of 2111 4th st., Lewiston, was hit in the abdomen, chest, leg, and arm by bullets fired in an apparent disagreement with Spellmeyer at an apartment upstairs from Thompson's. Spellmeyer, 27, is suspected of being an escapee from the Oregon State Penitentiary at Salem under the name Ervin Nichols, according to Steve J. Tobiason, Nez Perce County prosecutor. Nichols is being sought by Oregon authorities for escaping from the prison in August 1982. Nichols was in prison under charges of probation violation. A warrent for the arrest of Nichols from Multnomah County at Portland arrived at Nez Perce County Sheriffs Department Wednesday, according to Sargeant Bruce Birdsell. Another warrent from Oregon State Correctional officials is expected to arrive any day, and the county has been notified that Nichols and Spellmeyer may be the same person, Birdsell said. Thompson was in St. Josephs Hospital for a week as a result of the shooting. Spellmeyer will be sentenced on July 27. Thursday, June 23. Parents: Theodore Carl "Bud" THOMPSON Jr. and Laura Marie RAMSLAND. Rebecca Ellen THOMPSON1,2 was born on 26 August 1959 in Sioux Falls, Minnehaha Co., SD. Parents: John Darrell THOMPSON and Maureen Lou KAMPEN. Spouse: Denny Carl WINTERBOER. Rebecca Ellen THOMPSON and Denny Carl WINTERBOER were married on 26 July 1980 in Sioux Falls, Minnehaha Co., SD. Children were: Kyle John WINTERBOER, Patrick Carl WINTERBOER, Julia WINTERBOER, Alexander Denny WINTERBOER. Reed Vitoria THOMPSON was born on 12 April 2004. Parents: John Paul THOMPSON and Laura Irma SENSKA. Rhonda Lyn THOMPSON2,5 was born on 5 November 1965 in Walla Walla, Washington.3 Parents: Ronald Leroy THOMPSON and June Mae POTTER. many routines is a humerous tribute to Abbot and Costello and Rick's unsurpassable comedy lecture on ventriloquism; all interwoven with music from country, pop, and gospel hits. For your next special program you want Rick and SIDNEY. music comedy, and ventriloquism at it's best! Write P. O. Bo x 14861, Portland,Oregon 97214, or call 503-233-4082. I have personally seen this act and in my opinion this duo is as good as Edgar Bergan and Charley McCarthy were. Warren Roe Author. Parents: Lavern Ellsworth THOMPSON and Geraldyne Frances KENNEDY. Rick Lee THOMPSON2,5 was born on 25 June 1963 in Walla Walla, Washington.3 Parents: Ronald Leroy THOMPSON and June Mae POTTER. Robin Lyn THOMPSON1,2 was born on 11 June 1975. Parents: Dale Lewis THOMPSON and Marianne Ida KING. Living individual, details withheld Parents: Ora Harold THOMPSON and Myrtle Irene CHRISTEN. Spouse: June Mae POTTER. June Mae POTTER and Ronald Leroy THOMPSON were married on 11 November 1961 in Milton-Freewater, Umatilla Co., OR.3 Children were: Rick Lee THOMPSON, Rhonda Lyn THOMPSON. Rowena Frances THOMPSON2 was born on 30 March 1926.3 Parents: Harry Emi THOMPSON and Nellie Gladys WRIGHT. Spouse: Ernest Dean HERALD. Rowena Frances THOMPSON and Ernest Dean HERALD were married on 30 May 1948.3 Children were: Danny Dean HERALD, Debra Jane HERALD, Mary Kate HERALD, Jimmy HERALD. Ryan David THOMPSON1 was born on 5 January 1970 in Mitchell, Davison Co., SD. Parents: Keith Arlen THOMPSON and Gloria Faith SOLBERG. Spouse: Lisa FERGEN. Lisa FERGEN and Ryan David THOMPSON were married on 1 July 1994. Children were: Noah Christian THOMPSON, Carter Reid THOMPSON, Olivia Gabrielle THOMPSON, Sutton Ryan THOMPSON. Sally Jean THOMPSON1,2,27 was born on 7 February 1969 in LaCrosse, WI.3 She was baptized in Our Redemer Church, LaCrosse, WI. She was confirmed in Our Redemer Church, LaCrosse, WI. Infor. in file from Luella Thompson Feland. She earned her bachelor’s degree in Psychology from the University of North Carolina in Chapel Hill where she is currently pursuing her masters degree in Occupational Therapy. Sally has had a heart for those who are developmentally challenged since she was a teenager. That love has carried her into a career path in which she first worked with people with autism and then in early intervention for children from birth to age two. She hopes to use her skills in Occupational Therapy to help people with special needs. Parents: Thomas Andrew THOMPSON and Susan Jane RONEY. Spouse: Andrew Alan BOBER. Sally Jean THOMPSON and Andrew Alan BOBER were married in August 1994. Children were: Ella Martine BOBER, Anna Catherine BOBER. Samantha Maureen THOMPSON1,2 was born on 10 April 1993 in Owatonna, MN. Born at 12:54 PM, Wt 8lb 5oz, height 22in. Lots of black hair. Born at 12:54 PM, wt 8lb 5oz, height 22in. Lots of black hair Parents: Timothy John Dakotah THOMPSON and Kimberly Ann HINZ. Children were: Ayden Boyd . Sandra Lee THOMPSON was born on 31 January 1943 in Fargo, ND. Parents: Max Gerald THOMPSON and Nancy Lee "Nannie" MITCHELL. Spouse: George HUGHES Jr.. Sandra Lee THOMPSON and George HUGHES Jr. were married on 14 April 1961 in Fukoka, Japan. They were divorced in 2003 in CA. Children were: Mitchell Ann HUGHES, George HUGHES 3rd, Nicole Ann HUGHES. Sanna Decina "Sanny" THOMPSON2 was born on 3 March 1890 in Near Letcher, Sanborn Co., SD.3 She died on 4 August 1985 at the age of 95 in Colonial Manor, Corning, Iowa.3 She was buried in Strand Cem., Villisca, Iowa.3 Infor. in file is from the records of Luella Thompson Feland. Other family records were examined and compared. She was a housewife. Newspaper article; 94th Birthday, Sanna Anderson was honored on her 94th birthday last Saturday afternoon at the home of Mr. and Mrs. Bert Miller. Mr. and Mrs. Paul Odson were co-hostesses. The table was decorated with cards and the three bouquets of flowers she received from her daughter and family of Spokane, Wash.; a grandson, Duane Rhamy and family of Villisca, Iowa; and a niece Elma Tidwell of Marlow Heights, Md.. Another highlight of the afternoon were the telephone calls she received from her nieces, nephews, and grandchildren from six different states, all calling to wish her many more happy birthdays. Birthday cake and assorted sandwiches were served to the 46 relatives and friends who attended the birthday party. Newspaper obituary, Sanna Decina Anderson, daughter of John and Elsie Olson Thompson, was born 3/3/1890, at Letcher S. D., and entered into rest Aug. 4, 1985, at Colonial Manor, Corning Iowa, at the age of 95 years, 5 months, and 1 day. She was united in marriage Feb. 23, 1910 with Andy Anderson at Strand, Iowa. To this union five children were born. The couple lived in the Strand area most of their married life. She was confirmed in the Strand Lutheran Church. In 1951 they bought a small acreage in Nodaway and lived there until Andy's death on Oct. 23, 1951. Sanna moved to Westgate Housing in Corning in 1964, being one of the first residents to occupy the new apartments. In June of 1983 she entered the Colonial Manor Nursing Home and resided there until her death. She was preceded in death by her parents; her husband, and two daughters, Arlene Rhamy, and Edna Anderson. Funeral services were held at the Gauthier Funeral Home in Corning Aug. 6 at 2:00 pm, with Rev. Todd Walsh officiating. Interment was in the Strand cemetery. Music was provided by Melinda Hendrickson, organist, and vocalist. Casket bearers were Marion Hendrickson, Henry Hendrickson, Marvin Anderson , Darrel Shafer, Galen Shafer, and Kent Shafer. A copy of the funeral card is also in file, saying the same things as the newspaper obituary. Parents: John A. THOMPSON and Elsie OLSON. Spouse: Andy ANDERSON. Sanna Decina "Sanny" THOMPSON and Andy ANDERSON were married on 23 February 1910.3 Children were: Arlene Caroline ANDERSON, Edna Jeanette ANDERSON, Mildred Irene ANDERSON, Bernice Lucille ANDERSON, Shirley Ann ANDERSON. Sarah Elizabeth THOMPSON was born on 6 November 2011 in Omaha, Douglas Co., NE. Parents: Todd Frederick THOMPSON and Michelle MIKKELSEN. Sarah Marie THOMPSON1,2,27 was born on 8 October 1966 in LaCrosse, WI.3 She was baptized in Our Redemer Church, LaCrosse, WI. She was confirmed in Our Redemer Church, LaCrosse, WI. Sarah was educated BA in Communication from Lenoir-Ryyne, Hickory, NC. Infor. in file from Luella Thompson Feland. As a flight attendant for American Airlines she has flown and traveled to much of the US and several foreign countries. She continues to work as a flight attendant. Parents: Thomas Andrew THOMPSON and Susan Jane RONEY. Spouse: Kevin ADAMS. Sarah Marie THOMPSON and Kevin ADAMS were married in October 1997. Children were: Emily Jean ADAMS, Katherine Grace ADAMS. Sean Nicholas THOMPSON1 was born on 28 June 1999. Parents: Quentin Oscar THOMPSON and Jacqueline Kay WENZEL. Sharon Diane THOMPSON2 was born on 24 October 1943 in Elgin, Grant Co., North Dakota. !Infor. from Myrtle Thompson. Sharon works in a nursing home. In the social service, medical records, at Shoshone, Idaho. She was presbyterian. In 1997 she became Administrator of a nursing home. Infor. from her. Parents: Bertrum Adreas "Bert Andrew" THOMPSON and Myrtle Marion June FAUST. Spouse: Roger Vance JACKSON. Sharon Diane THOMPSON and Roger Vance JACKSON were married on 27 October 1960 in Grangeville, Idaho. Children were: Kathleen Ann JACKSON. Spouse: Gerard JENSEN. Sharon Diane THOMPSON and Gerard JENSEN were married on 25 June 1962 in Cour D Alene, Idaho. They were divorced. Children were: Julie Marie JENSEN, Dennis Andrew JENSEN, Curtis Lee JENSEN, Becky Lou JENSEN. Spouse: Marcos (Mike) (Michael) GALINDO. Sharon Diane THOMPSON and Marcos (Mike) (Michael) GALINDO were married on 4 December 1984. Sharon Gene THOMPSON was born on 10 October 1945 in Columbia, SC. Parents: Max Gerald THOMPSON and Nancy Lee "Nannie" MITCHELL. Spouse: Thomas A. HINGER. Sharon Gene THOMPSON and Thomas A. HINGER were married on 8 June 1963 in Amarillo, TX. Children were: Thomas A. HINGER, Craig Robert HINGER, Michael Dennis HINGER, Cynthia Anne HINGER. Sharon Louise THOMPSON1,2 was born on 4 June 1948 in Sacramento, CA. Infor. in file from Luella Thompson Feland. Sharon was married and divorced, nothing else is known. Parents: Chester Andrew THOMPSON and Lydia Jane ERHARDT. Spouse: Steven CHRISTENSEN. Sharon Louise THOMPSON and Steven CHRISTENSEN were married on 16 August 1969. They were divorced. Children were: Steven Michael CHRISTENSEN, Brent James CHRISTENSEN. Spouse: Jerry Wayne CRAIG. Sharon Louise THOMPSON and Jerry Wayne CRAIG were married on 4 August 1979. Children were: Aaron Bryan CRAIG, Adam Jared CRAIG. Stephanie THOMPSON2 was born on 5 February 1953.3 Parents: Basil THOMPSON and Lillian . Susan Marie THOMPSON2 was born on 10 April 1965 in Elgin, North Dakota.3 Infor. in file from records of Luella Thompson Feland. Susan is a housewife. Parents: Theodore Carl "Bud" THOMPSON Jr. and Laura Marie RAMSLAND. Spouse: Steve SWANSON. Susan Marie THOMPSON and Steve SWANSON were married in Nevada.3 Children were: Ashley Stevie SWANSON. Susan Marie Zahn THOMPSON1,2 was born on 20 September 1963. Parents: Alvin Oscar THOMPSON and Margene Esther Collins ZAHN. Spouse: Brian DODD. Susan Marie Zahn THOMPSON and Brian DODD were married on 22 June 1985. Sutton Ryan THOMPSON was born on 11 May 2006. Parents: Ryan David THOMPSON and Lisa FERGEN. Tamera Cozett THOMPSON2 was born on 9 October 1958.3 Parents: Eldon Emil THOMPSON and Donna Elizabeth REIGEL. Tena Marie THOMPSON2 was born on 6 December 1956.3 She died on 21 December 1956 at the age of 0.3 Parents: Harvey Thomas THOMPSON and Reta Rae MANGLES. Newspaper article in file; 5/13/1974, Fairbanks Tower Clears Two Pilots to Collision. Two airplanes operating on different radio frequencies collided on the south taxiway area at Fairbanks International Airport last night, but all occupants escaped injury. The pilot of the C46 apparently was unable to see the smaller Piper. The FFA said the C46'S props chewed up one wing of the Piper, ripped through the fuel tank and into the fuselage. Ylvisaker saw the C46 bearing down on him and attempted to avoid it, the FFA said, a move which they said may have saved his life. Theodore Carl THOMPSON was born on 24 November 1881 in Strand, Adams Co, IA. He died on 2 July 1957 at the age of 75 in Elgin, Grant Co., North Dakota. Infor. in file is from records of Luella Thompson Feland. Records kept by other family members, were examined and compared. A North Dakota death certificate shows; place death, Grant Co., Elgin, Lorenzen Mem. Hosp., 2 days. Usual residence Grant Co., Lark, North Dakota, rural. Lived on farm. name Theodore C. Thompson, dod 7/2/1957. Male, white, widowed. DOB 11/24/1881, age 75. Farmer, born Strand, Iowa. Father John Thompson, mother Elsie Olson, spouse Minnie Thompson. Never in armed forces, ssn 501-42-1042. Informant Richard Feland, Almont, North Dakota. Cause of death, congestive heart failure, due to arteriolosclerotic cardiovascular disease, onset to death, 15-20 yrs. No autopsy. Doctor attended from 6/30/1957 to 7/2/1957. Last saw alive 7/2/1957. Death 5:30 pm. Signed Wm. Buckingham M. D., Elgin, North Dakota, signed 7/3/1957. Burial 7/5/1957, Pleasant View Cem., W. of Lark, North Dakota. Signed Fun. Dir. A. F. Meyer, Elgin, North Dakota. Recd. by Registrar 8/17/57, signed M. F. Lundgren Registrar. No. 623. Theodore C. Thompson, son of John and Elsie Thompson was born in Adams Co., Iowa Nov. 24, 1881 and passed away July 2, 1957 at the Elgin Hospital in Elgin, North Dakota. He spent his early life in Iowa, and was baptized as an infant, at the Strand Lutheran Church. The family moved to S. Dakota where he lived a few years, and in 1906 he moved to North Dakota, where he spent the remainder of his life. In 1919 he was married to Ricka Voss, and to this union one daughter, Alma was born, who is employed in Washington, D. C. at the present time. In 1923 he was married to Mrs. Minnie Culver Brown, and three children were born to this union. They are Melvin, Lewiston, Idaho; Theo. Jr., and Luella Feland of Lark, North Dakota. He is also survived by six grandchildren, six living step-children, three sisters; Mrs. Lena Hendrickson, Villisca, Iowa; Mrs. Sanna Anderson, Corning, Iowa; Mrs. Clara Day, Lewiston, Idaho; and one brother, Bert Thompson, Lewiston, Idaho. His parents, wife, one stepson, and four brothers preceded him in death. He was active in community affairs and was a member of the Masonic Lodge, which group conducted graveside rites at the Lark, cemetery. Services were held at the Presbyterian Church at Lark, N. Dak. on Friday, July 8. Relatives attending the services from a distance were; Mr. and Mrs. John Hendrickson, and daughter, Villisca Iowa; Mrs. Sanna Anderson, Corning , Iowa; Grace Brown, and Thelma Brown Godfrey, and families, Jamestown, N. Dak., Bert Thompson and daughter, Sharon, and daughter-in-law, Mrs. Clifford Thompson, Lewiston, Idaho. This was a newspaper obituary. A second obituary; Theodore Thompson of Carson dies. Final rites were held at Lark recently for Theodore Carl Thompson, 78, resident of Carson area for 51 years, who died July 2 at the Elgin hospital. Born in Iowa, he spent his early life there and in South Dakota. He came to the Carson area in 1906, and homesteaded 7 miles north. He married Ricka Voss and to this union a daughter Elma was born. In 1923 he married Minnie Culver Brown. They were the parents of three children. He served as assessor of Carl Township for 28 years. He leaves two daughters and two sons, Elma, Washington D. C., Mrs . Richard Feland, Almont, Theodore Jr., Lark,and Melvin, Fairfield, Idaho, six stepchildren also survive, as do six grandchildren. to Washington D. C. in the late 1930'S, and is still working there for thegovernment. Elma married Robert Tidwell, 7/1904 TO July 1974. They had no children. Theodore was married the second time to Mrs. Minnie Culver Brown, a widow with 7 children. They were married 4/14/1923. Mrs. Brown was from Montgomery County, Iowa. She was born 4/20/1889 to Oscar and Dora McCue Culver. She died 5/16/1930. Theodore Thompson died, 7/2/1957. They are both buried in Pleasant View Cem., Lark, North Dakota. Children of 2nd marriage; Luella Elsie Thompson- 2/14/1924; Theodore Carl Thompson Jr. (Bud)- 5/10/1925, Melvin Allen Thompson- 12/18/1928. The dtr. Elma resided in Marlow Heights, Maryland. Parents: John A. THOMPSON and Elsie OLSON. Spouse: Ricka VOSS. Ricka VOSS and Theodore Carl THOMPSON were married in 1919 in Flasher, Carson Co., ND.3 They3 were divorced. Children were: Elma Leona THOMPSON. Spouse: Minnie Belle CULVER. Minnie Belle CULVER and Theodore Carl THOMPSON were married on 14 April 1923 in Carson, North Dakota.3 Children were: Luella Elsie THOMPSON, Theodore Carl "Bud" THOMPSON Jr., Melvin Allen DAY (THOMPSON). Theodore Carl "Bud" THOMPSON Jr.2 was born on 10 May 1925 in Flasher, Morton Co., North Dakota.3 Infor. in file from records of Luella Thompson Feland. Other family records have been compared. He worked in construction. A newspaper picture in file says; Is Assigned, Pvt. Theodore C. Thompson, Jr., 20 year old son of Theo. Thompson Sr., of Lark entered service on November 16, 1945, and has been at Fort Bliss Texas, receiving training. Theodore has recently completed basic training and is being assigned to occupation troops. During his basic training he qualified as a sharpshooter with a rifle and was given anti-aircraft training on 40 mm automatic guns. He was Lutheran, and was in both the army and air force in 1945. Parents: Theodore Carl THOMPSON and Minnie Belle CULVER. Spouse: Laura Marie RAMSLAND. Laura Marie RAMSLAND and Theodore Carl "Bud" THOMPSON Jr. were married on 2 April 1953 in Bismarck, Burleigh Co., North Dakota.3 Children were: Charmaine Kae THOMPSON, Terry Richard THOMPSON, Dale Lynn THOMPSON, Randy Warren THOMPSON, Susan Marie THOMPSON. Theresa LeAnn THOMPSON2 was born on 10 July 1978.3 Parents: Randy Ray THOMPSON and Janet Lea THOMPSON.